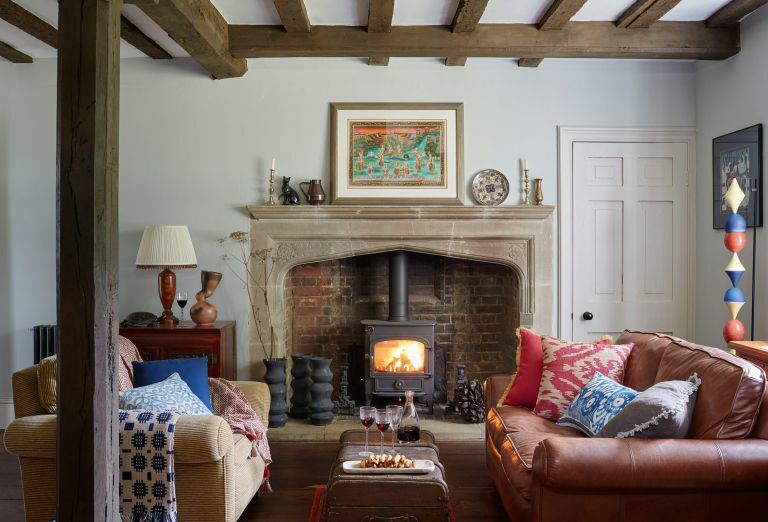 The LaRooys' renovation of their 14th century home in East Sussex lead to them being crowned the winning home in the 2018 Period Living Awards. 'They have incorporated everything they need for a modern lifestyle while still allowing the home's stunning period details to shine through,' says Period Living magazine's editor Melanie Griffiths. The judges were astonished by the sheer scale of the work Julie and Mike La Rooy took on and, of course, the results. Find out how they did it, then browse more real home transformations. Find out how to renovate your home in our guide, too. If you think your home can rival the La Rooys', enter Period Living's Home and Garden of the Year awards 2019. Owners Julie La Rooy, a yoga teacher, and her husband Mike, who works for a finance company. They have three grown-up children. Property A five-bedroom Grade II-listed house near Uckfield, East Sussex. What they did Repaired the roof, rebuilt a chimney, added new beams and steels to strengthen the internal structure, installed new plumbing and underfloor heating, refurbished the existing cast-iron radiators, rewired throughout, put in a kitchen and bathrooms, built a new staircase to the attic floor, laid a new floor in the sitting room, and restored all the original features. It’s not as if the couple didn’t do their research. Before they even made an offer, they enlisted a structural engineer to do a survey of the property. ‘He said it was in good condition for its age, which was true. The trouble was, the oldest part of the house is timber framed and dates back to the 14th century, and the rest of the building was built from stone in the 16th century. That’s a lot of years of wear and tear,’ says Julie. The house had also suffered from neglect, as the elderly previous owner had been unable to maintain it properly. To check they would be permitted to make the renovations and updates needed to make this historic house habitable and homely again, the couple employed building archaeologists to create an architectural timeline of the building, and also asked a conservation officer to take a look pre-purchase. ‘It became a listed property in the 1950s but didn’t have any planning permissions in place. We didn’t want to find out we needed retrospective planning or that we wouldn’t be allowed to make the changes we wanted,’ says Julie. Reassured there wouldn’t be any problems, they took the plunge. stove was fitted. The dining table is from Trading Boundaries and the leather chairs are from Heal’s. Despite their research, an architect recommended by the archaeologists, and a team of skilled builders, the building did throw up some surprises. ‘There was asbestos in the basement. The sitting room floor was rotten, so we could have plunged into the cellar below at any moment. And when we uncovered the original beams in the dining room, which had been hidden by lath and plaster, we found they were barely supporting the floor above,’ explains Julie. Fortunately, the layout of the house remained much the same. The major change was to take out the narrow Victorian steps to the attic and replace them with an elegant staircase. The loft is now a self-contained suite for daughter Elise, with a bedroom, sitting room and shower room. Decisions about the décor have been taken with the couple’s typical thoughtfulness, focusing on quality rather than trends. The handmade kitchen cabinets, for example, were based on the existing Victorian pantry cupboard. The chimney breast was widened by 10cm – a week’s work for one man – to fit the stove. ‘We used natural materials throughout because we want the house to be sustainable. We also wanted the work to last for a minimum of 20 years and not to become quickly dated and tatty,’ explains Mike. They’ve more than achieved their goal. This year, Mike and Julie’s painstaking restoration project was recognised by the Sussex Heritage Trust. ‘It was lovely to receive the award, but this has been about creating our home,’ says Julie.